Rather than write a plot description, simply look at the cast list above. That would be the main reason anyone would want to watch The Opium Connection. Well, I guess I'll do it anyway. Two guys from the U.N., Lincoln and Coley, played by Trevor Howard and E.G. Marshall, respectively, go to Iran to investigate the death of one of their fellow agents. Apparently, he was dealing with Iranian drug lords and attempting to buy whole poppy crops. To track the opium and see where it leads, they spike it with radioactive materials. This leads them from Iran, to various glamorous and not-so-glamorous locations all over Europe, and meeting many, many people along the way. And who is the mysterious woman they keep running into, Linda Gayle? Will they capture the head drug lord? Will they give the U.N. a good name? Yes, it's an international production, but with all those guest stars and locations, it's easy to turn into a sprawling, convoluted mess. How can the movie stay focused when every minute they have to go to a new place to introduce a new character? 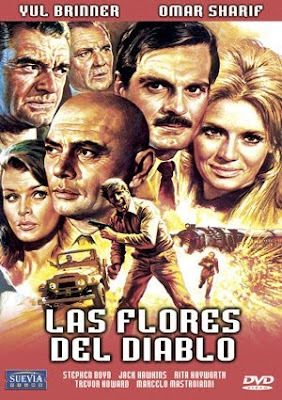 You get TWO performances by Trini Lopez, "Lemon Tree" and La Bamba", but my favorite appearance in the movie-long game of "spot the guest star" was by Eli Wallach. His scenery-chewing performance really stood out. But I guess he had to do something big to stand out in the muck and the mire. But I'm making it sound worse than it really is. 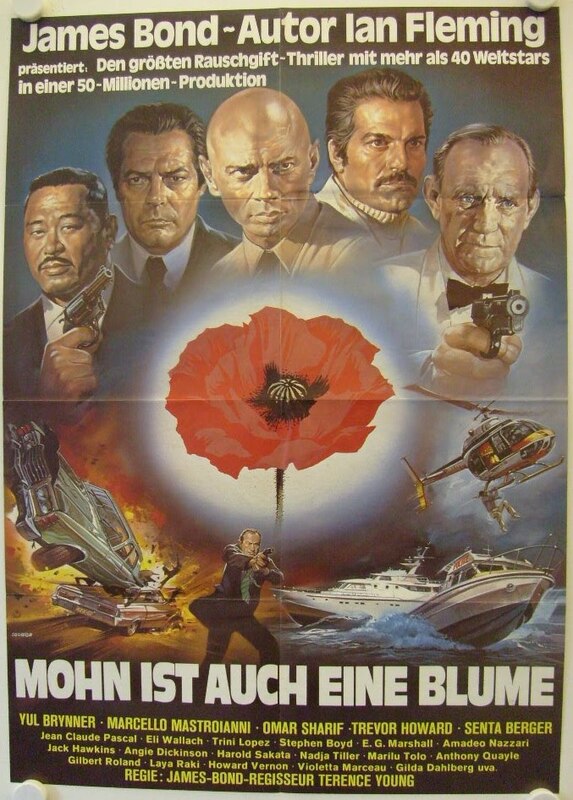 For instance, this is probably the only movie where you'll see the credits "based on a story by Ian Fleming" and "Executive Associate Producer Del Tenney" together. That should give you a really good idea of the vibe of this movie. Because Terence Young directed other Fleming-based movies (i.e., James Bond), there is a scene where they introduce a Geiger counter that looks like a cigarette case (they test it by all handling a radioactive cigarette...can they do that?) but there is a junky sensibility at work too. 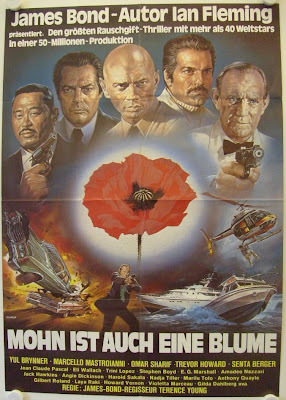 I know the actual U.N. was somewhat involved in the production of this movie, so perhaps this was all a P.R. thing to make it seem like the U.N. ISN'T a corrupt, anti-Semitic, do-nothing waste...so they figured, "let's make a staid, bland time-filler, but fill it with older stars!" Typical for the U.N., this plan DID NOTHING to help them. The sound on the VHS tape under review, released on the Simitar label, is buzzy and terrible, but maybe because it is in EP mode. 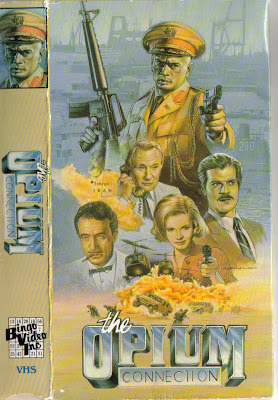 But it does have cool, nicely rendered box art. 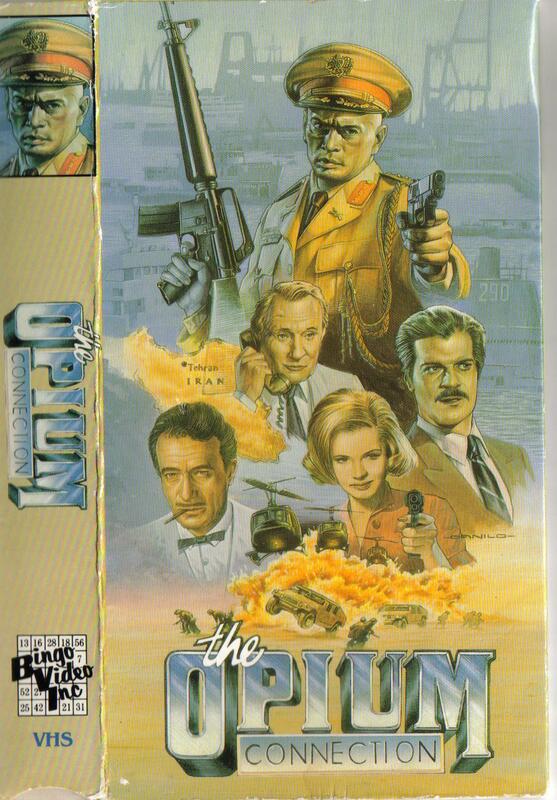 A Sunday-afternoon programmer type of film, The Opium Connection seems like the thing you might catch on channel 9 or channel 11 on a rainy day back in the 80's. Yes, Eli Wallach DID indeed stand out among "the muck and the mire". He won an Emmy Award for his performance as "Happy" Locarno, the only award the production received! Glad he was recognized by people other than us.